How many of us today, brothers and sisters, would cry out the same thing as Gideon just did? Does it not seem to you that we are surrounded by darkness on every side? Maybe in your personal life you feel forsaken? Maybe it’s been a long time since you have experienced the presence of God if ever? Have you ever said in your own heart, just like Gideon ” Where are all the miracles?” Maybe it’s been a long time since you have seen a loved one or anyone for that matter, well saved and radically regenerated? Now brothers and sisters, this is a theme all through Scriptures. Consider what Moses says after forty years in the desert after fleeing Egypt and believing ( rightly) that he would be used to deliver his people. Again it comes in encounter and the Lord commissioning , this time in a burning bush “ Who am I that I should bring the children of God out of Israel? (Ex 3:11) You see, as with Gideon, there is an encounter with God. Consider Jeremiah as he encounters God ” Before I formed you in the womb I knew you. Before you were born I sanctified you. I ordained you as a prophet to the nations. Then said I, Ah Lord behold I cannot speak for I am a youth.” (Jer 1:6) You see the reluctance of the prophets who know their limitations but it is God who calls and it is God who send and it is God who goes before. One more example would be the prophet Isaiah in chapter six. He encounters God and cries out ” Woe is me for I am undone because I am a man of unclean lips.” (Isa 6:5) There are many objections, and they are sound reasons, these prophets are not lying when they tell God how unworthy they are or how unable they are or how they cannot speak or are so very very weak. God knows these things. Yet God will share His Glory with no man. He picks the weak things of this world to confound the wise and to bring glory to Himself. It is He who does the calling, and it is obedience to the calling that is required. If you are not allowing God to use you because of how weak you are then maybe all of these prophets should not have moved forward with God either? The Lord raises up who He will. And now, in these latter days, He and He alone is raising up a remnant. And despite all of your objections, it matters not for He deliberately raises up the weak and the over-looked so that the glory that is soon to cover the earth as the waters cover the sea will be all His. He is raising up the broken and the battered, the lowly and the humble, to come against the proud and the strong and the mighty and the many. After Gideon’s encounter with God he begs Him not to leave. (v18) Can I tell you saints, one encounter with God, with the presence of God, ruins you for this life. His presence will become your all-consuming passion. Gideon, in a day of poverty and famine, insists on sacrificing to the Lord and he prepares the little that he had and he offers it to God. This is what happens saints when we encounter the living God. What was ours becomes His. We gladly give Him what we have, and if it is only a widows mite, we see from Scripture that the Lord is well pleased with this kind of sacrifice. Gideon’s sacrifice to God was well pleasing and acceptable, we see this because fire falls on acceptable sacrifice and consumes it. What will you sacrifice saints? After the offering Gideon cries out “ I have seen the angel of the Lord face to face.” (v22) This changes Gideon forever. Saints, have you had such an encounter? Has your life been drastically changed from the inside out? This encounter , not unlike Isaiah, was so traumatic that God has to speak into Gideon and say ” Peace be with you, do not fear, you shall not die.” ( v23) Now, how can we tell if we ourselves have been effected as Gideon? Well, when one encounters the Lord then idols have to go. Nothing can come between God and His people. And this is exactly what Gideon is called to do. Now, the children of Israel in that day worshiped Baal just as the those that surrounded them did. There will be a severe price to pay if Gideon breaks down the altar of Baal, in fact, in means almost certain death. I wonder if the saints of today are willing to pay such a price to see the idols of today torn down? Can we buck the system and the ways of the world and survive.just as the Lord has asked Gideon to do? Well, Gideon gets himself ten others who are willing to go with him, and at night, they tear down the altar of Baal. It does not take the people long to figure out who tore down their idol’s altar. They find Gideon’s father and demand that he hand over Gideon to be killed. Now, in wisdom that undoubtedly came from God, Gideon’s father says to the crowds that if Baal is so all-powerful, why are they here pleading on his behalf? Surely Baal is strong enough to exact revenge on his own? This argument works and of course Gideon did not die for Baal is a false God. Now, every time the people saw Gideon it was a testimony to the impotency of the god that they worshiped. Can you say, brothers and sisters, that you are a living testimony to the impotency of the enemy of our soul? Saints, God is raising up a remnant people who are a testimony to the one true living God. By defying the convention and idols and gods of our day, then we ourselves become a testimony and a witness to the world. Can you see the process we have to go through prior to the ultimate defeat of the our adversary? Gods children have to follow the same path as Gideon, before ever being involved in mightier battles to come. First Gideon had to see the desolation of a country devoid of God. Then he had to believe that he had been forsaken because this truly highlights our utter helplessness outside of God. Then he had to encounter God and see himself as he truly was, so that when God accomplishes great things through him he will be in no doubt that it was not by might nor power but by God’s Spirit and the Spirit alone. Then we see the hunger and thirst after Gideon’s encounter with the Lord and his willingness to give al that he had. It’s in this process that it is learned that God has called us, He prepares us and He anoints us. Then there is the obedience to defy the culture of the day and live as God has called us to live. This is the preparation process. There can be no short-cuts. Where are you in this process saints? Be encouraged, know that you have been called and you will be sent. Remember that God used the weakest man from the weakest clan who complained of being forsaken. Do not say that God cannot use you, for it is by calling that you are called. Follow the example of Gideon and continue to prepare. The time is short saints, the remnant are being raised. Reject the world and all that it has to offer and rise with them by the hand of God. For students of the Bible, the concept of the wilderness should be most familiar. Abraham left his homeland and family to venture forth into an unknown land of promise. Moses left the palatial comforts of Egypt to dwell among the rocks and wild beasts. 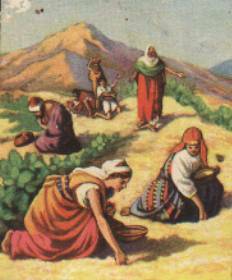 The tribes of Israel wandered 40 years in the wilderness prior to occupying the land of Canaan. Job lost everything that He might glimpse the Eternal One at the edge of the valley of death. David fled from Saul and spent years eluding him in the pathless wilderness. Most, if not all of the Lord’s holy and faithful prophets abandoned all they knew and loved to live alone with the Lord in His company and care. John the Baptist conducted his prophetic ministry as one “crying in the wilderness”. Jesus was led by the Holy Spirit into the wilderness forty days and forty nights, tempted of the devil and ministered to by angels. The Apostle Paul spent much of His life and ministry imprisoned, isolated, imperiled and alone. And the woman of Revelations 12 is sheltered and nourished in the wilderness immediately prior to our Lord’s return to this earth. My friends, this wilderness theme runs all through the Scriptures, and through the varied lives and experience of God’s children. It has always been an essential concept to be grasped, yet I believe this may be even more true today. It is vital that we understand what it teaches us about how our Heavenly Father, the Son and the Holy Spirit bring us to true faithfulness and blessing. Now the concept of the wilderness as it affects others is one thing – yet the actual experience of the wilderness as it impacts our own life and faith is quite another. It is a very intimate matter you see, challenging everything we think we know about God and the Christian life, the church and community, the actual and the superficial. It is wrought with difficult questions and seemingly few answers. It is typically invested with profound emotion, loneliness and even confusion. And it is more of a valley than a mountain-top, with again, seemingly little evidence that heaven is still there, and that Our Lord is still caring for His sheep. To understand the wilderness we must go deeper and further into the very heart and mind of our Heavenly Father, as He loves and nurtures His children. We must look beyond our teachers and books, for they – by and large – don’t really understand it. We must divest ourselves of any fluffy religious notions that really don’t get to the heart of a man or what really happened in that garden. We must also resist the theological urge to generalize and systematize, as God’s wilderness is as varied as His people, and as unlimited as His vast, creative mind. We are addressing this topic generally, in order that we might understand it better. We are also more specifically hoping to edify and encourage those, who like ourselves, find themselves outside and apart from the traditional church organization, having left it behind in order to more perfectly hear and follow the Lord. Today we are witnessing an interesting phenomenon where many – God knows the numbers – are leaving the relative structure and security of organized churches, denominations and memberships, to follow hard after their God, to a wilderness of sorts, a strange and unfamiliar place little understood by establishment Christianity. Perhaps the Lord is calling His remnant to Himself in simplicity and purity at the end of this age? Perhaps the prophetic ministry from outside the walls has begun, or at the very least is being perpetuated at this time? Perhaps a time of final testing for the church and Israel is poised to begin? Whatever the ultimate reason, many are coming out, and almost immediately they will need to adapt to this new and strange environment where the Lord alone is all that they have. Indeed, the world has infiltrated the church to such a degree, and corruption has become so rampant and pervasive that it is practically impossible to keep abreast of all of the apostasy and defilement within. By much spiritual evidence and observation, the ‘church on the corner’ is either dying or already dead. This is obvious and apparent to any with eyes to see, to those with true spiritual insight. Only those with a vested and carnal interest in perpetuating the corpse, and holding it up with strings will deny this. True spiritual discernment speaks otherwise however. A.W. Tozer and Leonard Ravenhill, for example, 20-40 years back can still be heard on creaky recordings woefully proclaiming the life of God pouring out of contemporary Christianity. Theirs were the prophetic forewarnings from within, all decrying the forces marshaled against the historic church – materialism, humanism, pragmatism, psychology, modern marketing, etc. Then, such corruptive forces were pressing at the edges; today they are rooted into the very fiber of institutional Christianity, across all lines, divisions and denominations. Those who would weep the tears of our Lord are indeed weeping, with great heaviness of spirit and heart. “Come out of her my people!” is the message of the hour! Come out of her, lest you share in her sins! But to where and to what – this is the question of the hour? Quite often when the Lord draws us out of something and back to Himself, we are led by way of the wilderness. It is this wilderness that concerns us here, and by His grace we will endeavor to more completely comprehend it. In this short piece we would like to touch on some key elements in this wilderness experience, including what it is, and why our Lord, in His infinite and loving wisdom might draw His children into such a condition. Perhaps you reading this now are in what you might consider a wilderness, alone with God, cut off in large measure from all you have ever trusted or known. Nothing now seems to make sense, even your religion or relationship with God. Everything appears dark and the way forward seems unfamiliar. Your faith is challenged like never before. The ground beneath your feet is shifting like loose sand. You turn to fellow saints for help and encouragement, but they just don’t seem to understand. All they seem to have is an argument or proof text trying to convince you that you are either in sin or rebellion. My brothers and sisters, we know that you are out there, and that you may be at this moment feeling isolated and alone. It is our hope and prayer that you will be encouraged and edified by the fact that you are not in any manner abandoned by our Good Shepherd, and that you are still very much in His capable and loving care. This wilderness you are in is not a denial of Christ’s blessing on your life by any means, but living proof that He loves you more than you can ever know. Indeed, the wilderness – however it is applied to the servants of the Living God – is first and foremost God’s idea. It is His wilderness. It is His way back to Himself. He needs to know that there are no circumstances, nor people that will cause you to deny Him. He needs to knows that He alone is your first love. He needs to know that, stripped of all religion and corporate piety, and spiritual machination, you will seek Him alone, for Himself and His glory. He needs to know that you love Him for Him and not just His gifts, and all of the many things church may have restored to you. All of the biblical examples given above can provide us with valuable insight into what the wilderness is, what it looks like (in general terms, as we are also acutely aware that the wilderness experience is manifest differently for each of us as God’s children) and what we can expect to find there. The Lord, in drawing us to Himself often brings us through the wilderness. Here we learn not to trust in ourselves, but in Him alone. He draws us out of wherever we are that we might learn to lean on Him for everything. He is now our way, and our provision. It is a time of total and absolute dependence on Him. He draws us away from all of the props and dependencies, our friends and family, our everyday structures and support mechanisms, that He might be the All that holds us up, and maintains our lives. We must learn to trust God rather than circumstances or people. We must look for the bread that comes from heaven and the water that comes from the rock. We must turn our backs on all we know, even those we love, so that He might know that we love him first and most, that He is enough if everything and everyone else is stripped from us. I have been considering something that A.W. Tozer once said in a sermon, and it was this – “What if all we Christians had was God?”. Not His things, nor blessings per say, but only Him. Not a hundred fired up preachers or prophets telling us about Him, but only Him. Alone with Christ, and He asking us “Do you love Me more than these?” as He did to Peter. “Am I enough for you, or are there other things you desire?” My friends, this is essentially what the wilderness is for – to provide our Lord with the answer to this question. All of my life I kept looking for Him in other things – people, groups, movements, trends, systems, you name it. Yet in the end He has brought me to Himself, quite part from anything else that may claim or represent Him. This is the wonderful thing about the wilderness – it reduces everything down to bare-boned, spirit-touching-flesh reality. It clears away all the haze and noise that may be preventing you from seeing and hearing God. If you have become a Christian, for example, to gain friends and community – if this is what you seek primarily – then the wilderness will isolate you so that He is your only friend and fellowship. Then our Lord will ask you bluntly – Am I enough for you? Do you Love me more than these? If Christianity and church membership is mostly about a healthy environment for yourself and your kids, for activities and programs, then here again, the wilderness will reveal this for the idol it is. The Lord must know, you see. And we must know also, and many will admit that so much of what we do as “church” today keeps us from coming into direct and personal contact with essential things. The wilderness is a wonderful instrument for stripping away all of our dependencies on things and shadows isn’t it? It is about survival and spiritual reality, life and death, hunger and thirst, breathing in and breathing out. Is He your All, my brother? Does living for Him alone define you my sister? We are religious by nature, but only His nature in us, refined and perfected by His Holy Breath and Spirit will satisfy the burning ache in your spirit. We must have Him, and know Him, and want Him, and trust Him, before He will grant to us all of the many blessings pouring out of Him. Is the wilderness a pleasant place? Not really – not how the world measures things anyway – for only here it seems do we come to recognize what we are actually made of, that we are carnal and earthbound, that our faith is largely theoretical, not tried and tested in the fiery furnace of experience. Like earthbound Jacob, wrestling with the Lord, we come to the end of ourselves that He might begin in us anew. My brethren, I am sorry if this seems so different from what you have been taught to expect. Yet it is the truth and it is the Lord’s way. It is not the church’s way, and so for the most part those affiliated with it will spurn it, and judge it as illegitimate. Those who seek to save us from all that such a wilderness will present, will obviously fight against it with all they have. It represents no small threat to all organization and mediated leadership; to the self-exalted priest class that has come to rule so much of the body of Christ in our day. Read Job’s account and affirm what some of us have already discovered in our wilderness walk – that even God’s peace and presence is seemingly withdrawn, causing us to question how much we really trust Him. Even when He withholds the manifest evidence of His presence, when He appears to have turned His back to us and stopped His ears, will we continue to bless Him and to love Him? Despite an often prolonged and overwhelming sense of bewilderment, discouragement, isolation and even guilt, will He remain our only Hope, our Heavenly Father and Loving Shepherd? Will we hold fast to Him or let Him go? Trust is often forged in darkness and silence, when our experience and expectation of what this new life means appears to be in contradiction. My friends – this reveals yet another aspect of God’s wilderness. All of the so-called experts tell us how human beings innately require a community; yet what happens when the Lord is our only community, when all we have is Him, when even the ones we love abandon and forsake us? When all of their words make us feel only guilt and even more bewilderment, when they cannot seem to comprehend the legitimacy of what is happening to us. So much easier to pray down God and all His angels to extricate us from our isolation and hardship. And it is inconceivable to so many believers, not knowing the Lord or His wilderness, that this very thing could be sanctioned and even enabled by God Himself, out of His love and mercy for His beloved children. “I will build my church”, proclaimed the Lord Jesus Christ. Yet this is apparently not good enough for the many man-size church-builders among us, who seek to separate us from God with all their various methods and mediators. By directing all of their resources at maintaining and perpetuating their precious institutions, they fail to recognize that the God they serve doesn’t care one bit for their institutions. He cares for His children and will spare no effort – even resorting to the wilderness if necessary – in building them up to perfection in His Beloved Son! Hear this please, all those who have ears to hear. I believe the Lord may be trying to get the attention of His people. We like to be busy don’t we? We almost have an inborn, driving need to advance, to move forward, to do great things for the Lord. Results and numbers and growth are the gilded idols of our day, and they have penetrated the church of Jesus Christ. My friends, if the Lord Himself was so concerned about tangible results and numerical growth, then why did He choose to sideline the greatest evangelist who ever lived? Why indeed did the Apostle Paul spend so much of his ministry shipwrecked, on remote islands, and in prison when the entire world awaited? Have you ever wondered about this? I have. Perhaps the Lord was ministering unto Paul during this wilderness time? Perhaps He didn’t want Paul to get too heady about all of the wonderful things (the results) God was doing through Him? Perhaps our Lord was communicating intimately with Paul some of the awesome concepts and revelations found today in His epistles to the churches? Perhaps there were people and connections that could only be cultivated there in the wilderness, off the beaten path, there in the shadows? My brethren – there really is so much the Lord does not allow us to see, in terms of His larger plan, isn’t there? To our carnal nature, and to all that we are as men and even Americans, this wilderness makes absolutely no sense at all. We want to get into the game desperately, and yet the Lord wants us on the sidelines, or maybe even outside the arena and cut off entirely from all the action. He wants us to Himself. He wants to know if He is enough all by Himself, independent of His gifts and blessings, and all of the noise and trappings of religion and community. But for how long, you say? Certainly not for years and years? My dear brethren – it is up to Him entirely as our wise and loving Father. Consider that David, running for his life from King Saul in the wilderness, could have ended his isolation on more than one occasion. Yet he trusted in the Lord, that at His appointed time, he would be restored to the fellowship of Israel and his family. Keep this in mind when you are tempted to forsake the wilderness on your own terms. Consider Job’s friends who sought to persuade him to curse God and die. Heaven is silent while the church is having a party down the block. What will you do? You look for sense when nothing, not God, nor the situation itself, makes any sense at all. Explanations are few, if at all. You can either come to hate the wilderness and seek a way out, or you can trust He who loves you enough to allow such things. His plan is so much larger and wider and deeper than our loneliness and disillusionment. As God, He is under no obligation to reveal all or even any aspect of it to us. Is the devil in the wilderness? Likely He is. Yet the Lord and His angels are there too, ministering to us, teaching us, tearing us down and binding us up, comforting and communing with us, revealing His glory to us in quiet revelation and intimate miracles. It is the place where a still small voice can always be heard, where the grandest and god-sized things are reduced down that we might grasp them and go with them. It is the barren and rugged terrain of the prophet not the priest; where created things are laid naked before the great “I Am”- that Awesome, Uncreated One who broods over all the earth, seeking merely one who will prove faithful. My friends – I don’t pretend to see it all clearly yet, but I believe that in these Last Days the remnant of the Lord (the few out of the many) will commune with Him in the wilderness in preparation for His coming. Always between the gardens is a wilderness, it seems, where saints have long hungered and thirsted after God. Perhaps it is in the wilderness where the Church and Israel are ultimately reconciled in the heart of God? The Book of Revelation hints at this. Perhaps in these last tumultuous days, there is spiritual and even physical protection to be found here for the Lord’s own? Perhaps the true church of Jesus Christ has always been a wilderness people, largely unreported, off the radar, disenfranchised, de-legitimized by establishment and institutional Christianity? Quietly and faithfully and simply, they go on serving the Lord in the back alleys of life, away from the rush and clamor of church bells and choirs? Is your faith rugged enough, my brother? Has it been tested by wind and storm, my sister? Can you still follow Him without a scripted program, a schedule, a holy day, a church bulletin? Can you worship Him without a music director, without a big band and choir, without the predictable lyric of the song sheet? He is coming! And He will first come to His own. If this be true, and it is – then where will they be found in these final hours of Adam’s reign? What will be sustaining them as they wait patiently for Him – will it be the bread from heaven and the water from the rock? Or will it be the delicacies of Egypt – meat and wine that turns foul in their bellies? When all mediators between them and God are removed, and He stands before them, will they be able to recognize Him, and love Him, and hear Him? Will His sheep follow Him at this time when their very lives will depend on it?